2011 was a great year, and thank you all for being with me through it! This year saw me moving into a new school, getting to work with some great people and organizations on presentations, and being invited to develop new apps with Barbara Fernandes and Smarty Ears! A big WOW of a year overall. 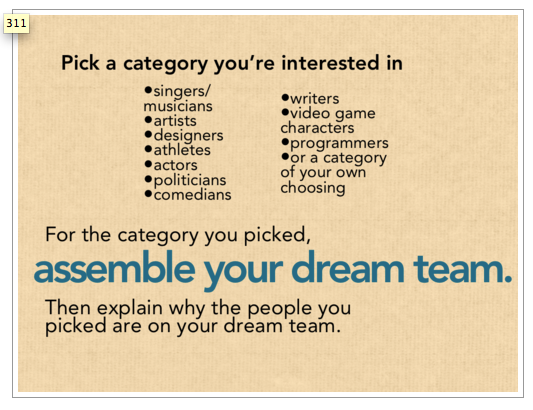 In 2012 I am looking forward to the above endeavors, in addition to regular content here on SpeechTechie. I am thinking of a month or two on animation, in all its forms, and other Web 2.0 creation tools. Of course, I have a lot of apps I want to tell you about too! 9. Welcome to Glogster EDU Week! Interesting selection! It sort of cracks me up when what I think of as kind of a throwaway post like the one on Noddy Fun Time ends up with a large amount of hits. I was proud to have guest posts by creative professionals like Janelle, Meghan Graham and Diana Richardson this year, as well as using themes such as Glogster. And of course we had the launches of Therapy App 411 and Essential Tech Skills 4 SLPs, which we will continue to tend to in the New Year. More of that to come! When I finish my lunch, I throw away my tray. In either case, and in most of the items, the child is asked in some sense to put themselves in the scene to be a voice within the picture. Some kids, of course, struggle to do that, and as my students exhibited a level of frustration and anxiety that prompted me to discontinue this subtest after a few items, I was left with the need to quantify their syntactic abilities (and, oh well, no Core Language Score). Language sampling was on the agenda, of course, but both kids were very engaged by the iPad, so I found myself turning to Mobile Education Store's Language Builder ($7.99, iPad only). Language Builder is an open-ended tool within this app studio's line of apps in which audio can be recorded to match picture and language prompts. Or, in this case, I used the most open-ended option in the app, simply asking my students to "Make a sentence about the picture." In both cases, it was an enjoyable and engaging experience for the child, and gave me key information about their sentence formulation abilities, along with transcribable (or demonstrable for parents) audio samples in response to the pictures. Language Builder has different levels of "hints" that prompt various language structures, and could of course be used for all those kids that complete Formulated Sentences and don't do so well with it. I actually have also been using it in conjunction with the excellent Conversations with Conjunctions program (Catherine Harkins May, Pro-Ed), which involves the use of ASL signs for conjunctions in order to provide a visual and kinesthetic cue. 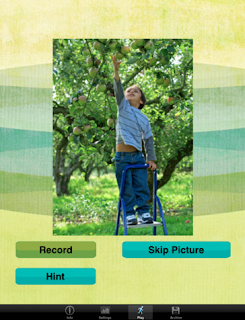 Overall, it's a great go-to app to address the difficult-to-assess (and treat) area of complex sentence development! Zite works somewhat like music app Pandora in that you can then further customize your feeds by giving a thumbs-up or -down to articles that appear or request more from the author, source, or subtopic. It is easy to share articles by email or send to Twitter, Facebook or other services, making Zite a great tool for participating in your Personal Learning and Sharing Network. Zite is somewhat more of a leisurely experience than using Google Reader as you don't have a number of unread posts to contend with; just read what you want! Because Zite allows you to set up multiple profiles within the app, it could also be a tool for helping older students do research or explore topics of interest and work on comprehension and language strategies. This will be my last post until 2012- hope you all have a wonderful holiday season and Happy New Year!! Blog Awareness Month: Edublog Awards, YAY SLPs, Thanks!! The Edublog awards is sometimes the recipient of criticism for being about things educators supposedly shouldn't care about: validation, self-promotion, competition. Fair enough, sure, there are elements of these things during "awards season." For me, though, it is really about ensuring that all these people who are sharing great ideas are actually READ. It sounds trite and eye-rolling but I definitely enjoyed nominating more than being nominated. All in all, SLPs made an amazing showing in this years' event. 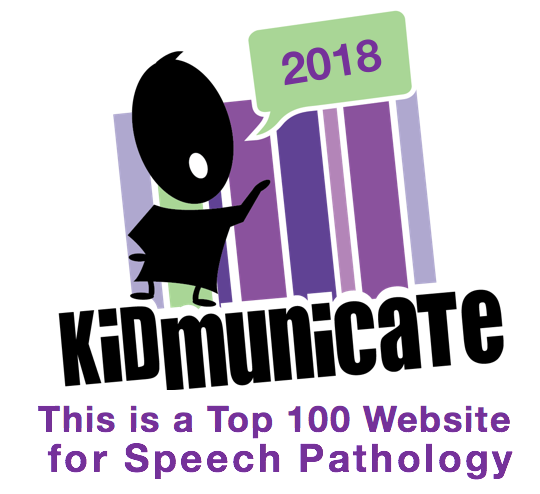 Besides being singled out by the organizers as being a great community and having 8 different specific SLP contributors shortlisted (sifted onto the final list of nominees based on some subjective measures of engagement with their blog), 6 different SLP resources were named as finalists (top 5 in their category). It's a really big WOW. Best New Blog- Speech Room News and All4MyChild. Best EdTech/Resource Sharing Blog- Cindy L Meester's Blog and some other dude. A few years ago, there weren't too many of us SLPs in social media. Now people might start actually understanding what we do! THANKS very much for all your support and votes. Please be sure to check out all the nomination posts written by SLPs if you missed 'em. Charles Schulz's Peanuts comics often conceal the existential despair of their world with a closing joke at the characters' expense. With the last panel omitted, despair pervades all. The result could be interesting to SLPs not only as a narrative intervention, but also to teach kids about self-talk in a humorous way, perhaps by having them replace the fourth panels with positive outcomes! As someone who has made social media somewhat of a way of life, it is interesting to see other people I know get involved online for quite different reasons. I am speaking of my personal friend Kristin McCarthy Macchi and her funny and moving blog Running to be Still, in which she documents the trials and triumphs of her son James, who is on the autism spectrum. 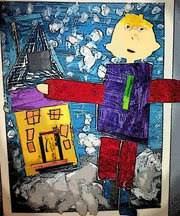 As SLPs, it is important for us to see the perspective of the families of the children we work with, and being connected to blogs such as this one is one way to develop that understanding. Also be sure to check out Kristin's Facebook Page for other links and observations. There's just so much science, nature, music, arts, technology, storytelling and assorted good stuff out there that my kids (and maybe your kids) haven't seen. It's most likely not stuff that was made for them... But we don't underestimate kids around here. Off the grid-for-little-kids videos and other smart stuff collected by Rion Nakaya and her three year old co-curator. I bumped into Mindpop when a friend of mine (a friend of the author) posted it on Facebook. The author, Nina Mitchell, introduces her blog: "I am a quirky young woman whose Mind went Pop. I was 26 when a stroke took away my limbs and speech. This stroke comic book is designed to make you think. Mindpop. Strokes are hell. They have dark comedy too. I live in Boston, just finished grad school, back to work." Mindpop is a good blog for SLPs to follow in order to fully understand the perspective of our patients who have had CVAs, but also possibly to recommend and/or use in counseling these patients. Writing Prompts is a blog that presents attractive visual prompts that could be used for an oral presentation or piece of written work. 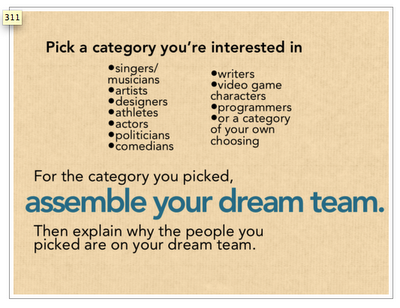 The prompts are imaginative and engaging, though they will obviously not work for all students. Try using Writing Prompts with your favorite expository or narrative text structure graphic organizers. We often hear the question from parents: What can I do to help my child at home? I try to keep a list of resources I can tell parents about, and here's one for you: Chris and Melissa Bugaj's Night Light Stories. Chris, an Assistive Technology Specialist and SLP, and his wife Melissa, a classroom teacher, have created this blog and podcast featuring original stories "that light up the imagination of kids of all ages." Each story is relatable to children's lives and begins with a question that promotes "making connections," a strategy our students often have to employ in the classroom. In addition to the stories (which can be heard on the blog itself, downloaded for free from iTunes or streamed though Instacast), the blog offers entries related to each story, with a review of Tier 2 (as in Isabel Beck's work, not RTI) vocabulary and fun activities for children and parents to complete together related to the context of the story. The audio (particularly the shorter "Flashlight Stories"), vocab and activities would also be great for SLPs to use directly during sessions! Check it out and please recommend it to your families. Blog Awareness Month: Support SLPs Shortlisted in 2011 Edublog Awards! 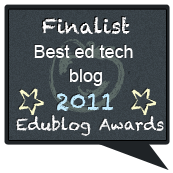 I'm really honored to be nominated in the Best EdTech/Resource Sharing Blog Category. Thanks a lot to Tanya Coyle of Lexical Linguist and Twitter Dagobah, Heidi Kay of PediaStaff, Chris Bugaj of A.T. Tipscast and the folks at all4mychild for the shout-outs. Your support means a lot. So, please vote for all the SLPs and others in the mix! Best EdTech/Resource Sharing Blog- Cindy L Meester and I are in there! Best Open PD- Edcamps, open PD that is happy to have SLPs in attendance! Thanks, and be sure to check out as many nominees as you can! In my previous post, I reminded you about the SLP Blogs Bundle, which you will need to re-subscribe to periodically so that you can view any new blogs added to the bundle in Google Reader. 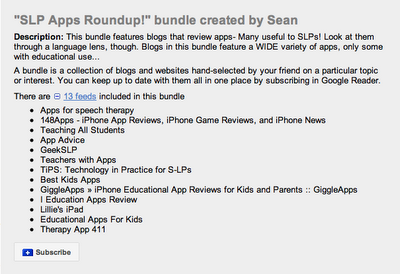 Recently, I put together an additional and different bundle, the SLP Apps Roundup. This bundle consists of some SLP and education-related blogs that feature iOS Apps, but also some general app review blogs. These blogs, such as App Advice (also available as an app on your iOS Device and highlighting the blog's great App Guides and Lists), present many apps, some of which can be "repurposed" for therapy. You'll need to use your critical thinking to decide if you want all of these blogs, and even more so when downloading apps, but I thought you might find the "Roundup" helpful. You can subscribe to the Apps Roundup here. GiggleApps is a great example of a blog that is worth following in this bundle or on its own. The blog features in-depth reviews of apps for kids and will help you tease out those that might be applicable in therapy. The mission statement of the blog: "Written by an iPhone loving mom, our goal is to find great apps for kids from toddler to teen. Apps that make you giggle and hopefully teach you something too." I have long been a proponent of using Google Reader to view blogs. In fact, I will go further than just suggesting it and say that if you are looking at a lot of blogs and not using Google Reader (or an alternative), you probably shouldn't bother since you will be wasting so much time. If you have a list of blogs you like to visit, it really does not make much sense to bookmark them and visit them individually. You have no way of knowing whether the blog has posted anything recently, or alternately you will end up missing new posts. Using the free and easy Google Reader service solves this problem by letting you view all your blogs in one place, and indicating which blogs have new posts. You have access to Google Reader if you have any kind of Google account, such as Gmail or Docs. To add a blog to Reader, just click Subscribe and paste the URL of the blog, or type the name of the blog to search for its "feed." Some time ago, I began building a "Bundle" of blogs written by SLPs in order to encourage others in our field to read these folks' contributions to the blogosphere. There are many great SLPs currently blogging in order to discuss professional issues, resource reviews such as apps, books or websites, session plans, or just their take on life as an SLP. The SLP Blogs Bundle allows you to subscribe to all these blogs (currently over 40) at once, and you may have already. However, the Bundle does not refresh in your Reader when I have added new blogs to it. You have to go back and resubscribe, and you are of course welcome to unsubscribe from anyone in the Bundle whose writings you don't find as valuable as others. They won't know you did it, I swear! Jill Kuzma's Social and Emotional Skills Sharing Site- great ideas and visuals, many pages of resources and links to Pinterest Boards. The Speech Dudes- really intelligent and funny analyses of topics related to Speech Language Pathology. The Learning Curve- creative ideas and organizational tips for SLPs. so to Speak- a very well-written and fun chronicle of SLP grad school. Activity Tailor- more creative activity ideas for SLPs. ProjectSLP- reflections on SLP practice. Megan Panatier Bratti's great resources via her Avocado Tech Facebook Feed. Below is a video I made that goes through the recent changes to Google Reader, how to use it, and how to access the SLP Blogs Bundle. Hope you enjoy! December is Blog Awareness Month on SpeechTechie, a month of posts dedicated to blogs (and blog-related tools) of interest to SLPs! Blogs, to be honest, have developed a little bit of a bad rap. Though it was once quite trendy to have a blog, the term "blogger" now has some connotations that aren't so positive: wordiness, self-absorption...but enough about me. What do you think of me? Oh, I lost track of myself there. from The Lawrence and Julie and Julia Project. I blame the backlash against blogs at least partially on the film Julie and Julia. Just about no one liked the whiny Julie blogging parts. Another factor is the level of activity on "micro-blogging" sites such as Twitter, Facebook, and Google+, where people share information in more bite-sized chunks. That's very important, and I get (and share) tons of ideas from participating in these circles, but I definitely think there is something to be said for topic-focused blogs that explore ideas in more depth. So this month I will be standing up for the blog as a source of information, perspective and, of course, of therapy tools. I will start with one of my favorites: Zen Habits. Zen Habits has simple and strong messages about how to deal with life's stresses, of which SLPs certainly have their share! Leo Babauta and his guest posters remind us how to breathe, simplify, focus, live in the moment, and be happy. The blog has a great "start page" of posts you might want to begin with.